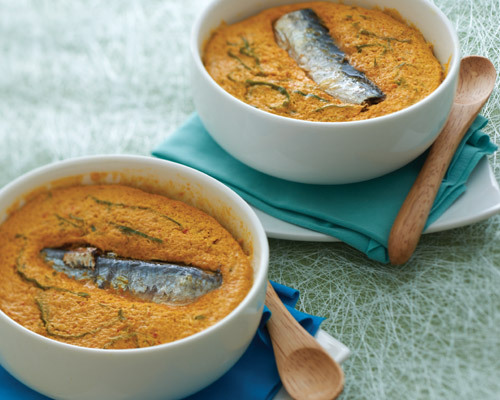 In a blender, combine one piece of sardine with the extra virgin olive oil from sardines can and the rest of the ingredients except turmeric leaf. Blend till fine. Pour mixture into individual molds or a round baking dish. Top with the remaining sardines and turmeric leaves. Steam till cooked and serve hot. Comments: Nutrient analysis above is based on Ayam Brand™ Trim Coconut milk.